It is painful to watch the prime minister "pleading" with EU leaders to grant another extension to the Brexit date, Arlene Foster has said. The DUP leader told the BBC she found it "humiliating that we are having to go and beg so that we can leave". On Wednesday, a special EU summit will take place as leaders consider Theresa May's request. 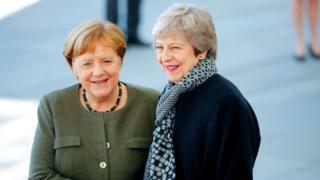 Mrs May is meeting German and French leaders on Tuesday afternoon, in a bid to seek support to postpone the Brexit date again. But Mrs Foster criticised the Prime Minister saying she "needed to be strong, she needed to show leadership, and I'm sorry to say that hasn't been evident in this past couple of months". "She is the leader of a party that said they would deliver on Brexit and at the moment she is failing to do that," she added. Meanwhile, the Taoiseach (Irish prime minister) Leo Varadkar has said he is "confident" an extension will be agreed at the EU summit. Leo Varadkar said the discussions would focus on the length of any extension and the conditions applied to it, such as shaping a new Common Agricultural Policy (CAP) and electing the next president of the European Commission - and whether the UK could be involved in these decisions. He said many EU countries were concerned that Brexit was "taking up so much of the EU agenda".